VitabridC12 has done it again and made an amazing product, the Vitabrid Dual Serum. The Serum is designed to provide powerful anti-aging benefits to brighten, tone and soothe the skin while correcting damage from the environment. Vitabrid Dual Serum, bottle. combines two serums (vitamin C and peptide complex). The bottle design houses the separate serums in the same bottle which gets mixed together upon opening ensuring you’re getting the freshest product possible. It’s so easy, spill proof and sterile. To mix the serums to one, simply rotate the bottom of the container clockwise to release the yellow Deep Care Serum and shake the bottle to mix it with the clear Skin Barrier Serum. For the serum to maintain a stabilized state, they are mixed only prior to use to activate the ingredients, maximizing freshness and delivering optimal results. The serum turns from clear to yellow indicating that it is mixed. VitabridC2 Vitabrid Dual Serum is sold as a package. It comes with three one 10 ml bottles, each providing a 10-day supply to ensure the serum is entirely used during its peak state of freshness if you purchase. Vitabrid Dual Serum is easily absorbed and delivers proven anti-aging benefits and an even skin tone both internally and externally. Our product review team and editorial staff recommend use for women in their 40s who have uneven skin tone and/or environmental sun or wind damaged skin and would like to try to reverse the damage and look more youthful. Vitamin C is a powerful brightening ingredient with antioxidant benefits. It helps correct and prevents age spots and blemishes while improving collagen production at a cellular level, helping to maintain vibrant and firm skin texture. It also makes skin healthy and radiant by reversing the damaging effects of free radicals due to environmental exposure (UV, pollution, stress) and by helping repair visible signs of aging. 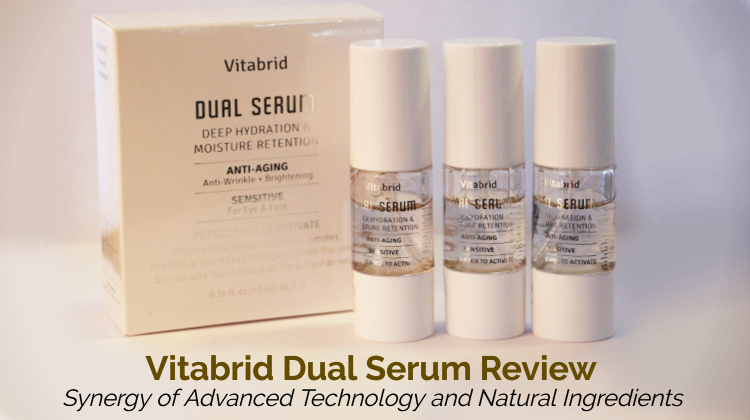 Vitabird Dual Serum should be applied twice daily. It should be the first product that be applied to the skin after cleansing and toning. A moisturizer with sunscreen should be applied over the serum in the morning and a night moisturizer appropriate for an individual’s skin type should be used over the serum at night. When Osmosis Pur Medical Skincare company decided to send us a free bottle of their Nourish Organic Facial Oil, our review team and editors were delighted. Skincare oils just have a feeling of being on top of your skincare routine. It is sort of the ultimate product to keep facial skin nourished through the day, especially those with aging or dry skin. 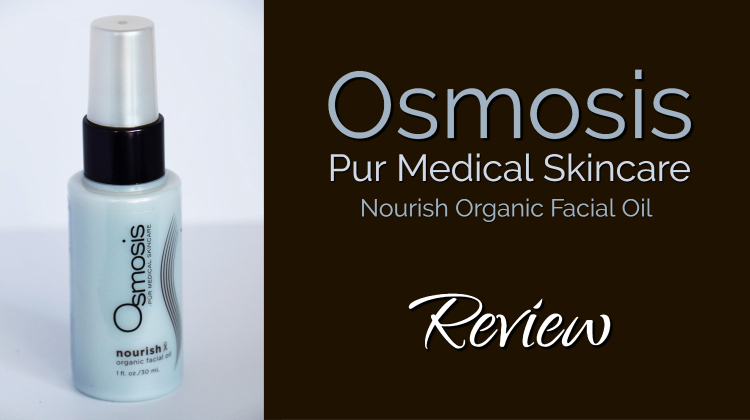 Our review team found Osmosis Pur Medical Skincare, Nourish Organic Facial Oil was ideal for those in their late 30s and 40s whose skin is stressed and need to bring their skin back to ultimate health of replenishing and locking in moisture. The rich nutrients and cold-pressed, organic avocado oil hydrates and rebalances deep into the dermal layer of the skin and you will see good results. There were noticeable results using Osmosis Pur Medical Skincare, Nourish Organic Facial Oil and we would recommend it. A few drops of oil goes a long way, so use sparingly when you’re applying. Just like with traditional moisturizer, it’s a good idea to apply a facial oil when your skin is still damp to help lock in hydration. Simply use massaging motions to blend it onto your skin. Ideally, use after your serum application, simply shake gently Osmosis Pur Medical Skincare – Nourish Organic Facial Oil bottle, pump into clean washed, dried hands and massage a small amount on your face. Make sure to keep away from your eyes. If needed, follow with a moisturizer. The Sephora Pro Airbrush #55 makeup brush is an excellent brush and everyone should have one in their cosmetic bag. I discovered this brush after noticing several beauty experts on YouTube raving about it. The brush has synthetic bristles to ensure smooth, streak-free application designed to create a natural airbrushed makeup look without having to use an expensive airbrush. Ideal for use with your favorite liquid, cream, powder foundations, concealers, blush, or contouring products. Sephora states on Amazon the Pro Airbrush #55 makeup brush is their “best selling brush”. I have used this brush for four years and still love it. If you don’t have one in your makeup bag, you are missing out. I think I started using mascara when I was fifteen. Since then, I have been searching for mascara that separates my lashes individually, defining my eyes, and it goes on without clumping my eyelashes together. You think this would be an easy find since every mascara claims it does this, but they just never live up to what they claim. Ideally, mascara should separate eyelashes while darkening them for that model fashion magazine cover natural look. Most mascaras do a decent job of this, while others have an impressive factor such as Maybelline Great Lash Mascara and Lancome DEFINICILS High Definition Mascara , but only Dior show Iconic Mascara from Christian Dior really makes me go wow! I can’t say it enough: Christian Dior’s Diorshow Iconic Mascara is my favorite and does everything I expect a mascara to do. I have tried other brands and I keep returning to Diorshow Iconic Mascara. It just does what we all dream of when using mascara and is hassle free. I never had to use an eyelash comb to correct my eyes after using Diorshow Iconic Mascara, which I do with every other mascara. It separates lashes like I haven’t seen before, darkening and extending the lash while looking natural and not clumpy. Diorshow Iconic Mascara is pricier than drugstore brands but worth every penny.